NO OTHER UPFRONT COSTS - NO BOND FEES OR CLEANING FEES ! Seabreeze House is only 100 metres to Hopkins River for fishing and boating. Take a leisurely stroll 700 metres to Logans Beach, great for the family and pets to exercise. Then walk to the Historic Proudfoots Restaurant on the River for breakfast or cuppa. Remember to bring the camera in July to Oct when the whales can be viewed from a specially built viewing platform 1200 metres from Seabreeze House. Across the road, there a cafe, brimming with delicious homemade cakes and biscuits and all your daily essentials like the morning paper and milk? Seabreeze House is only 1km from the whale viewing platform so come and stay see our most valued treasure. Seabreeze House offers privacy, quality and affordable accommodation. It caters for people of all ages with plenty of room to move for families and easy access and no stairs. All linen provided EXCEPT for towels. Seabreeze welcomes well behaved four legged friends and provides doggy essentials like bowls, beach towels and treats. Pets Welcome inside but must be well behaved. Owners to bring dog bedding. We ask that pets be under owners control at all times. No puppies please. Dogs must be house trained. Pets not permitted on beds or furniture. Guests are responsible for any damage incurred on property. Your dogs will love being close to Warrnambools only dog friendly beach for exercise and lovely walks, it is only 700 meters from Seabreeze. There is plenty of off-street parking for cars,boats or trailers. Complete with LCD TV and DVD there is a selection of movies to enjoy while you relax by a cosy gas heater. After a day of sightseeing, enjoy a barbeque in your private and secure backyard. Warrnambool is located only one hours drive from the 12 Apostles on the Great Ocean Road. It has beautiful beaches, historic Flagstaff Hill Maritime Village and the Southern Right Whales which visit in June to Oct.
A few minutes on from Warrnambool is Tower Hill a wildlife haven and dormant volcano where koalas, emus and kangaroos roam freely. Popular for picnics and nature walks. Warrnambool is renowned for its restaurants and bistros which offers a wide array of Australian and multicultural dining opportunities. 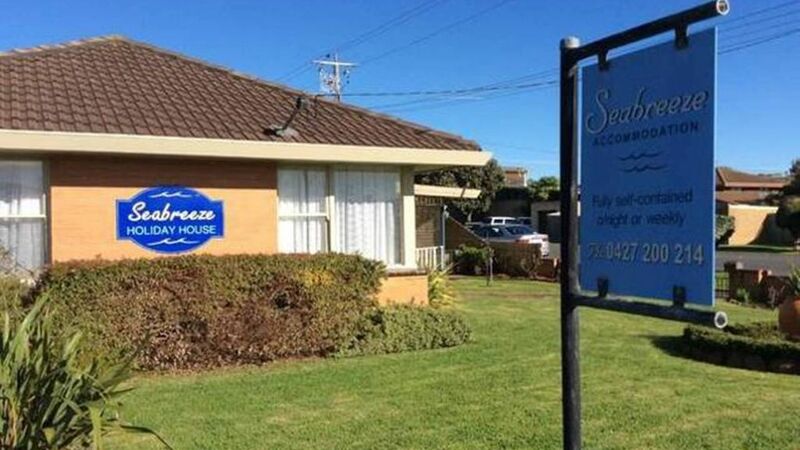 We have owned and run Seabreeze House for 14years and love living in Warrnambool. We take pride in providing our guests with comfortable clean accommodation but also giving value for money. We are pet friendly as we know guests love to bring their dogs with them on holidays, they love the big backyard and having the beach close by for exercise. We bought Seabreeze as it was in a lovely spot near historic Hopkins River and Logan’s Beach where the whales come in annually July to October. We do not charge any extra fees like Bond or cleaning fees as we believe our guests will respect and love Seabreeze and what it offers. Home away from home feel about the place with large garden and private enclosed back yard. Location as walking distance to Hopkins river and the Sea. One of the most Scenic areas of Warrnambool. 1 km from Seabreeze House across Hopkins River bridge to the sea. 100 metres to edge of Hopkins River, 700 metres to Logan’s beach a total of 1 km to the River mouth that meets the sea. Airconditioning in main lounge through double doors to Dining room. Also ceiling fans in lounge and both bedrooms. Split split system heat or cooling plus gas heater in lounge room. Electric heater in main bedroom. Separate Living room and separate dining room with dining table. Undercover seating front of Seabreeze house overlooking garden. Perfect little house for a getaway with your fur baby! Highly recommended especially for dog owners. Its not just a place that allows dogs, but is designed and caters to your dog. Very much appreciated. Thank you so much for your kind review, feedback is so important to us as we try to think of ways to improve our accommodation all the time for our guest and their pets. To hear you had a comfortable and enjoyable stay is very much appreciated and I hope you can come back another time, you are always welcome. My sister and I grew up in East Warrnambool, a stone throw from the Hopkins River. We spent many carefree hours exploring along the river's edge with our dogs scampering at our heels.My parents lived and worked there for over sixty years, only moving to be closer to family for health reasons.This year, my mother and have returned to spread my father's ashes in the locations that meant so much to him; a sportsman who loved golf and tennis in his retirement years. The priority for us was that we could find dog friendly accommodation in the same area. Seabreeze House was in the perfect location with a secure back garden for our two dogs, both 9 years old. The special touches of welcome by the owner alleviated our travel fatigue after three hours on the road. We were home again. After taking our dogs for a walk to the mouth of the river, we settled in, feeling confident that these rooms could be heated or cooled according to the varying conditions of outside conditions in Febuary and contrasting needs of a nearly ninety year old and a sixty plus year old. The owners of Seabreeze House are ahead of the times in their understanding of how important "a man's best friend" as a travelling companion can be to the mental and physical health to people of all ages. Seabreeze House is in a great location far from noise and traffic, but only a two minute drive to the town shops, experience nature, endless sandy beach. Amazing home/house, spacious, wonderfully decorated, very comfortable, great atmosphere. The whole house was so well equipped. Only a 5 minute walk to the Hopkins River, and no shortage of walking tracks just at the end of the street. Only a short drive to all the major attractions, and loads of sightseeing locations. We Loved The Comfort Of Our Stay And Will Certainly book Again. Thank you so much John for your wonderful review of Seabreeze House, I am so glad you enjoyed your stay and that we could provide you with all the comforts and location conveniences to make you holiday a great one. Walkalong Hopkins River to historic Proudfoots restaurant. Whale viewing July to October .